The Arrowhead Gallery ETC is a co-op gallery of 25+ artists from the Southern Utah Art Guild. The gallery has a diverse selection of art from all mediums – painting, photography, jewelry, ceramics, and metal. The artists represented range from amateurs to retired professionals. All have a passion for creating beautiful art. The gallery isn’t about one artist or one style or medium – it is about a diversity of art and creativity. This is about a co-op of artists with a collective desire to create art and explore ways to share their art with others. The Arrowhead Gallery ETC is a collaborative venture between the Southern Utah Art Guild and the City of St. George. The Southern Utah Art Guild had been trying for years to find a venue to display its member’s art. The City of St. George envisioned an art space along side the newly refurbished Electric Theater. A partnership was formed with the common goal to create a gallery to provide emerging artists a venue to display and sell their art in a professional setting. The city further envisions the Arrowhead Gallery ETC and the Electric Theater Center to become a cornerstone for an “art district” in located in the city center. The Arrowhead Gallery ETC is just one part of the Electric Theater Center. Along side the Gallery is the newly renovated Electric Theater, a 300-seat venue for the performing arts. In addition to the Arrowhead Gallery ETC, the Electric Theater Center also has studio space for up to 6 working artists, office space for art organizations, 3 classrooms for art instruction, a dance studio and 2 art workshop rooms. The Arrowhead Gallery ETC artists went through a vetting process where their work was juried and selected by art professors and professionals from universities throughout Utah. 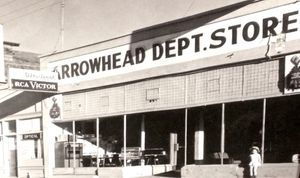 The building that previously occupied the 68 East Tabernacle address was the Arrowhead Department Store. According to locals, the “Arrowhead” name comes from the Arrowhead Trail, the original highway from Los Angeles to Las Vegas to Salt Lake City. This route opened in 1917 and generally followed “Old Route 91” through St. George along what is now Tabernacle Street. It was obvious to the artists and to the city that the gallery needed to be called the Arrowhead Gallery ETC (Electric Theater Center) – a name connecting the past with the future.